There seems to me a common thread that runs through impassioned references about the Declaration of Independence, that being a profound lack of basic knowledge of the historical document’s content. Worst among all claims relating to our nation’s celebrated artifact is the use of the Declaration by non-secular con artists whose livelihoods are made duping the willfully ignorant. I can think of no worse example, no more damning evidence to support claims that our nation was founded as some quasi-theocracy than the Declaration of Independence. 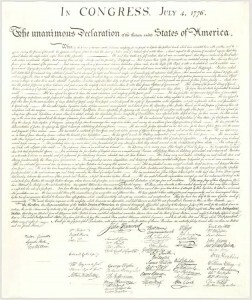 Beautifully written, the Declaration is a memorial to The Enlightenment in general, and secular government specifically. The Second Continental Congress was not just announcing the severing of all political ties from a nation, but from a monarch. What makes this most unheard of for the times is the rejection on philosophical of an obligation to be ruled of a king whose authority is ordained by none other than God. Even if you overlook the hypocrisy of a congress that excised all reference to slavery in the Declaration, (which alone should take some of the reverence felt in the 21st century towards our official statement of separation from The Crown), the two passing references to our Creator and divine providence, added after the committee draft was submitted, you can’t reasonably ignore the secular nature of the rest of the document. Collectively, our treatment of American History has been deplorable long before standardized testing dealt its horrid blow to critical thinking. We treat biography with no meaningful distinction from fairy tales and our written artifacts are revered with all the care of a Hallmark card, if that. I’m not claiming to be surprised by the ease with which the Declaration of Independence is marketed with contempt for the truth, but I sure hope that what should be self-evident truths about our country’s secular status can get something close to equal time with the downright lies about our national origins. Actually the term “our Creator” was the term used in place of “God” by deists ( like Jefferson) who believed that a power had created the universe, with laws of nature (physics) left to govern the day-to-day functioning of his/its creation, and had left the result to function without further intervention–hardly the hands-on world of Christianity. Thank you for your accurate observation, Bernard. 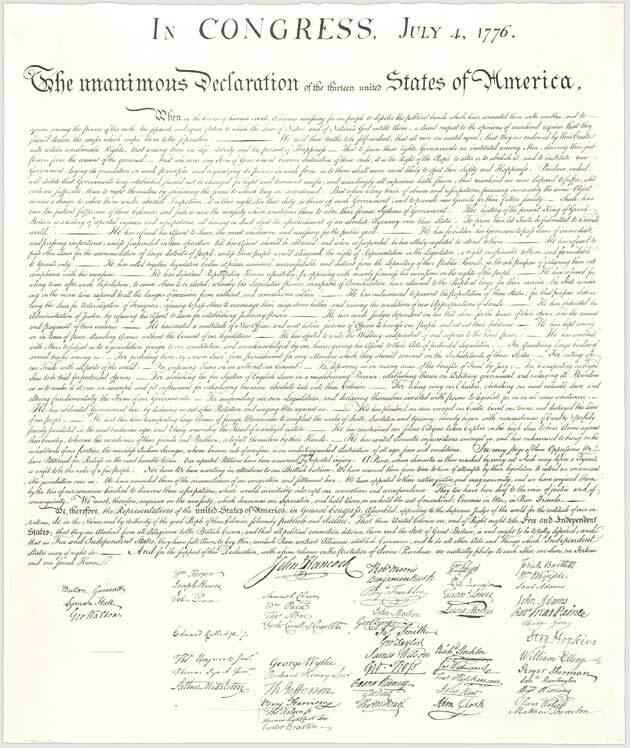 While “hijacking” the Declaration of Independence is a frequent sport across the political landscape, what seems to me the most egregious misrepresentation comes from those whose intentions are anything but non-secular. To hold up the Declaration as evidence this nation was intended for exclusive rule by and for one faith contradicts both fact and logic. The signers of the declaration whose faiths ran from active church members to those, like Jefferson, who held the clergy in some contempt, were rebelling against a King ordained by none-other-than God and officially sanctioned by the Church of England, a fact carefully and timidly kept out of most public school history texts.